Evgeni Plushenko at training camp in Pinzolo, Italy. Evgeni Plushenko, the 2006 Olympic Champion and two-time Olympic silver medalist of figure skating has revealed his new short program for the 2013-14 season during a performance at the conclusion of a training camp in Pinzolo, Italy. The Russian star has selected Taka jak ty by the Ukrainian band Okean Elzy, a new and different music, that hasn’t been heard on the ice before. The program starts quietly and builds toward the end. The skater did not perform the program with the content that is planned for later, however, he included a triple toe, double Axel and a double Lutz (but did a triple Lutz in practice). “Okean Elzy is a very popular music group in Russia and Ukraine. This is a song from the movie We are from the future, Plushenko explained. “We built this program together with Maxim Staviski and David Avdish.” He added that they also have an interesting and unusual idea for the free skating. 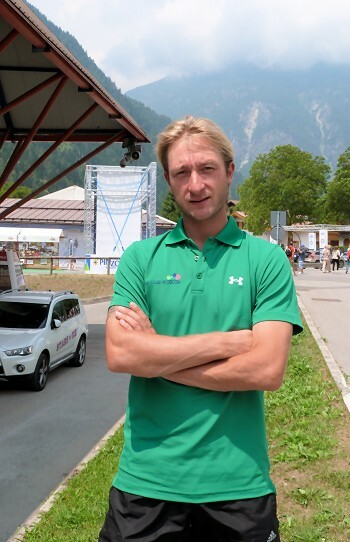 Following his back surgery and disc replacement in February, Plushenko was off the ice for four months and resumed regular on-ice training only in Italy when the training camp started in June. The 30-year-old feels that he is making good progress in his recovery from surgery, “but I am not rushing anything,” he pointed out. He had to cancel a show appearance in Japan in mid-July as he had not completely recovered at the time and was still in pain. The training camp consisted of on-ice practices and off-ice training including golf, soccer and athletic training. The skaters left Pinzolo on July 19 and went to Tartu, Estonia, for the second camp from July 22 to August 3. Plushenko is working on his free program with Staviski and Avdish in Tartu. “The next step is the triple Axel,” he said, meaning that he will work on it in Tartu. Following this camp, the three-time World Champion wants to continue training in St. Petersburg before heading to a training camp of the Russian team and the pre-season test skates in the Olympic city of Sochi.